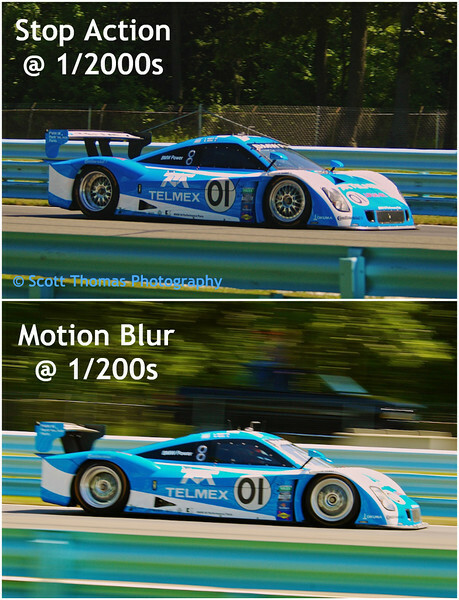 While I was at the race in Watkins Glen a couple of weeks ago, I took these two photos to show the difference between stop action and motion photography. There are many times when stop action is great in sports photography but racing cars are not one of them. When you use a fast shutter, the cars look static if the wheels are seen (upper photo). There is no way to tell if the car is moving or just sitting on the track. By panning the camera with a slower shutter speed (lower photo), you can see both the car and its wheels are moving very fast. Giving the sense of motion in a still photograph. Now that you know more about how to show motion in a still image. Check out my blog’s assignment this month: Assignment 20: Motion. This entry was posted in Photography, Sports and tagged "Sahlen's Six Hours of The Glen", 80-400mm, blue, bmw, car, daytona prototype, international, motion, new york, nikon D70, panning, racing, stop action, vr, watkins glen. Bookmark the permalink. I admire anyone who can a take a photo of anything in motion. Good job, Scott! Thanks for the tips. Fantastic example of how panning really adds to the feeling of motion and is so worth doing!